Every landlord wants to keep the tenants for longer periods and this requires keeping them happy. When tenants are happy, they won’t move out and the landlord’s life will become a lot easier. Happy tenants seldom complain and are also likely to renew their lease agreement. There are several advantages of having long-term renters. The primary one being that you won’t have to go through the tiresome phase of finding new tenants. Searching for the perfect tenants is definitely a daunting task as there are various steps involved. From advertising the property, which isn’t free of course, to showing the rental unit to prospective tenants and conducting appropriate screening of candidates, It is indeed a long procedure. So if you are satisfied with the tenants, it is better to prevent them from moving out. Here are some helpful tips to ensure that you enjoy a long term relationship with your tenants. As a landlord, you must let your tenants know about your expectations from them in the very beginning. This will help in avoiding conflicts and confusion in the future. Helping your tenants understand the rules of your property before moving in ensures a smooth tenancy period. Furthermore, it is also your responsibility to be upfront while explaining the rules and/or procedures that the renters need to follow along with providing them clear documents. Ideally, you must include the rules in a detailed and comprehensive lease agreement. If there are additional addendum then you must include them and make sure that the tenant has signed and dated the addendum. You must also provide a move-in package to your tenants and explain all the terrible situations that you have encountered previously so that you don’t face them in the future. Such as, if your previous tenants were noisy then it is your legal right to produce a Quiet Hours Policy in which you will include the exact definition of quiet hours, the period that is to be observed as quite hours such as from 10 p.m. to 8 a.m., what sorts of noises should be prohibited during quiet hours and what will be the consequences if the rules are not followed by the tenants. You may also provide information about the consequences of first offense then second and third etc. The schedule of trash and bulk garbage collection should be included along with phone numbers of local electric, gas and cable companies. Include a list of actions that would be considered as damage to the rental unit and possible repair costs. Such as if the tenant decides to change apartment color scheme and does not repaint it before moving out then they will have to pay you $200. Also, you need to draw guidelines to be followed if tenants have a complaint about another tenant such as what they should do deal with the tenant directly or inform you or call the police? You also need to include information about the time of the day and the feasible days of the week when you can be contacted. Procedures to be followed in case of emergencies, emergency exits and phone numbers of police, fire department and poison control. You need to make your tenants feel comfortable and looked after in order to prevent them from moving out. Complaints are a necessary part of the deal and when tenants feel that their problems will be addressed quickly, they will feel satisfied. It could be anything, faulty sewerage system, leaking hot water tap, bugs and noisy neighbors. So, if the tenants feel that their issues are given top priority by their landlord then they will feel happy and won’t think about leaving the property. Also, you must aim to resolve complaints within a week’s time and provide information about high priority complaints, which will be resolved on immediate basis (for instance, broken lock of front door) and medium to low priority complaints. Complaints that pose security hazard must be resolved within a day but issues like broken kitchen cabinet can wait for a few days. Landlords need to specify the method of lodging complaints, such as email or cellphone, and the suitable time and day of the week when tenants can contact them. There should be adequate information about how to deal with emergency situation and whom to contact. This would involve description of what is an emergency situation and what is not. Tenants must feel relaxed and comfortable at the property and this is possible if you carry out regular inspection and perform preventive maintenance to keep the rental unit in top class condition. This would minimize the frustration of your tenants as they won’t have to deal with problems on their own. Furthermore, performing periodic maintenance is important to improve your property’s aesthetic appeal; you may add minor touches like installing home security system, improving the front yard appearance, beautifying the area with plants or repainting the exteriors to help the tenants feel privileged. Usually landlords like to collect the rent on the first of every month but it is a good practice to allow your tenants a grace period such as give them time until the 5th of the month for rent payment. This grace period must not involve any penalty because this way, the tenants will not feel pressured. However, it is your responsibility as a landlord to make it clear to the tenants that any further delay in rent payment would result in a penalty. Also mention the penalty amount beforehand. Being too strict in rent collection will discourage the tenant and being too flexible will be unfavorable for you as tenants will not follow a definite schedule for payment of rent. Giving them grace period will make you look like a lenient and cooperative landlord. Your little gestures of goodwill will prove to be critical in making or breaking the tenancy agreement. After the tenants move in, you can provide them basic utilities such as light bulbs, toilet paper or edible items to facilitate them. Later on, you can send your tenants small gifts like free ham for Christmas, season’s greetings or birthday wishes to create favorable impression. You may also offer discount on rent if tenants sign two-year lease and offer them free upgrade of kitchen, bathroom or repainting of the whole apartment upon renewal of lease. 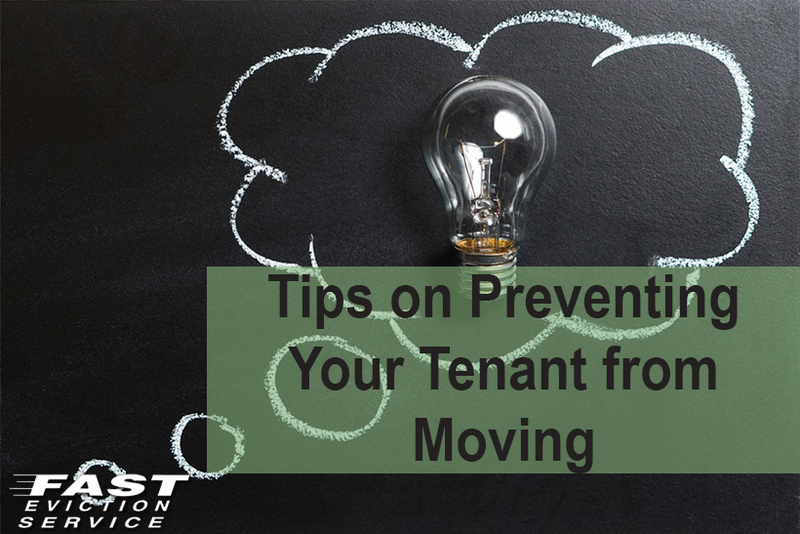 Use these important tips on preventing your tenants from moving out and you will be happier by keeping your tenants happy and staying longer!